Pharos, the ancient lighthouse of the port city of Alexandria, was one of the seven ancient wonders of the world. Built on an island in the harbor of Alexandria, the Greeks created a causeway the lead to the island and separated the port into two. Ptolemy commenced this magnificent building around 297 BCE, to protect ships from the precarious nature of the harbor. Greco-Roman architecture was used in designing the lighthouse. 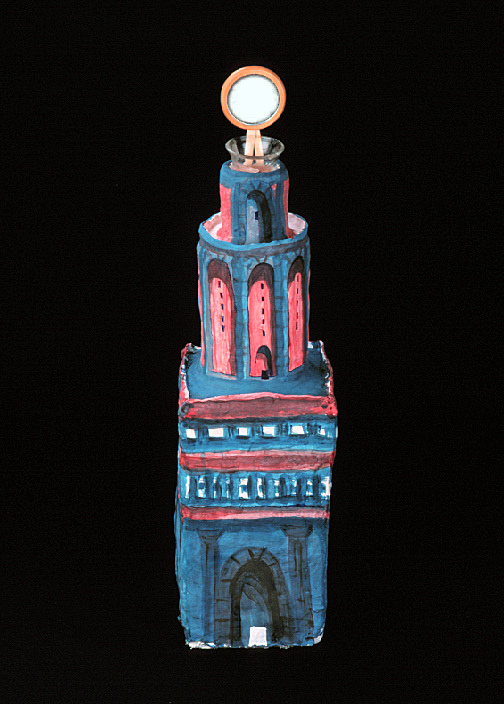 The bottom of Pharos rose to a height of sixty meters, while the octagon and the top circular portion of the lighthouse were thirty and fifteen meters respectively. These dimensions make Pharos a monument of grandiose proportions--it is said that the light from the top could be seen for 34 1/2 to an amazing 300 miles away. The fire would have been placed at the bottom of Pharos. Mirrors, made of very polished bronze, lined the entire inside projected the fire onto a mirror at the top. During the day, the sun's rays were used to project the light; this was convenient since Pharos was mainly used during the day, as many ships did not sail at night.